The Handlink AP-100 Smart Wi-Fi Access Point is designed as an essential component in the Handlink Hotspot solution to extend outdoor/ indoor Wi-Fi coverage and increase last mile coverage depending on site survey for broadband connectivity. With its powerful built-in smart antenna, its signal processing technique can track and locate the antenna beam on the mobile/ target to reduce Interference signal and boost the signal strength. The AP-100 also improves the link budgets as much as 16 dB and significantly enhanced network coverage and capacity in Hotspot Solution. The AP-100 is designed and purpose-built for service operators. Its built-in traffic shaping based bandwidth control mechanism allows the control of uplink and downlink traffic throughput on a per-client or per-VAP basis. A full set of networking and management features are available to meet carriers’ requirements. The AP-100 is a key component in wireless broadband access provisioning. 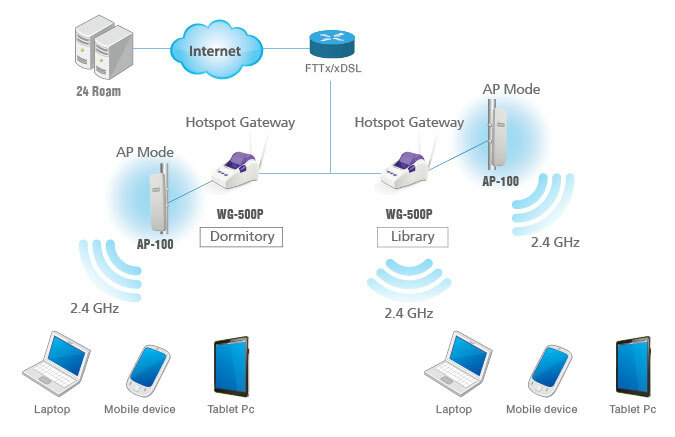 It can be installed outdoors by the side of a window, mounted to a wall, at the rooftop of a building or placed at the desktop inside for fixed broadband access provisioning.The AP-100 can also be used as a standalone Wi-Fi Access Point for smaller networks supporting 802.11b/g/n clients. The Handlink AP-100 is the most cost effective and versatile way to replace traditional last mile access. It can be used to build a high capacity Wi-Fi system that achieves the fastest ROI for both telecom operators and enterprises. The AP-100 is also an important complement in Handlink’s Hotspot Solution to increase coverage and improve Wi-Fi performance. It perfectly works with Handlink KS-852/861 and ISS-7000 v2 as public Wi-Fi solution to extended long distance application. High performance antenna with 20 dB front-to-back ratio, which is on average 5 dB better than others in directional transmission without picking up unwanted signal.